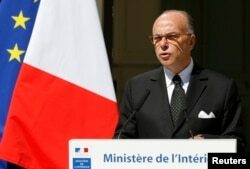 French Interior Minister Bernard Cazeneuve said France will reinstate controls on its borders for about a month around a major United Nations climate conference in Paris. Cazeneuve spoke on BFM television Friday, saying the controls will be part of larger security measures around the climate conference slated to run from November 30 to December 11. Cazeneuve said the controls will remain in place for a few weeks before and after the conference. France will be using the same set of laws that have allowed other European nations to close their borders this year to cope with an unprecedented influx of migrants fleeing violence in North Africa and the Middle East. FILE - French Interior Minister Bernard Cazeneuve attends a news conference at the Interior ministry in Paris, France. Cazeneuve said the new controls will remain in place for a few weeks before and after the conference. Six families from Syria and Iraq on Thursday flew from the Greek capital, Athens, to Luxembourg as part of a new European Union program to repatriate migrants without the arduous overland journey that endangers lives and strains EU members' border security agencies. France has been the scene of several high-profile attacks this year, including January's deadly shootings at the Paris headquarters of a satirical magazine and at a kosher grocery store. In August, several American service members and a British citizen prevented a heavily armed Islamic extremist from carrying out an attack on a train from Amsterdam to Paris.